Black voters have overwhelmingly supported the Democratic Party for the last fifty years-and for their loyalty, black Americans have been rewarded with worsening schools, collapsed families, skyrocketed incarceration rates, disappearing jobs, and rising crime. 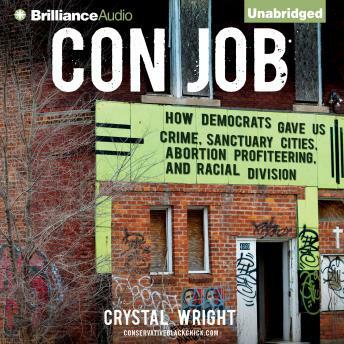 Crystal Wright, editor of the blog Conservative Black Chick, exposes how the Democratic Party has systematically betrayed black voters.Democrats have pulled a big con job on blacks in America. Black voters have overwhelmingly supported the Democratic Party for the last fifty years. Where has that support gotten the black community? Democrats have let black incarceration rates rise and marriage rates drop. They've let entire neighborhoods become dependent on welfare, and they've let education and job opportunities dwindle. So why do black voters keep voting for progressive Democratic candidates? Crystal Wright, editor of the blog Conservative Black Chick, takes the Democratic Party to task in this bold, biting exposé of the Democrats' systematic betrayal of the blindly loyal black community.